Most people will never get a chance to host a television talk show, much less lay claim to inventing the genre. But if you’re in a field that has a healthy conference circuit, you may one day be called upon to moderate a panel at an industry event. If you want to make the most of your moderator role, I suggest that you take a lesson or two from talk show pioneer Joe Franklin, who died this week after a uniquely impactful broadcasting career. Joe Franklin was brilliant. I interviewed him twice for the Hudson Reporter newspaper and once for the Across the Hudson television show. What makes Joe Franklin unforgettable is that he makes a person feel like an old friend and the most important person in the room. He worked out of an office that was completely cluttered and messy, multi-tasking on a pair of Trimline phones. When I interviewed him, he had a phone in each hand. He had no answering machine, so he constantly told the person on one line to hold on while he answered the other. “I can’t talk right now, I’m being interviewed by the New York Times,” he said. It took me a second to realize he was talking about me, since the Hudson Reporter is a suburban weekly, not the paper of record. The point was he treated this lowly new reporter like someone at the top of the field. He once told me that there are no bad guests, only bad hosts. And he demonstrated this in a reel video of a local impressionist that he passed along to me. The video was painstaking to watch. For an hour and a half I watched this poor fellow do impressions of Dr. Ruth and Ronald Reagan at birthday parties and Elks Clubs. It was embarrassingly unfunny. The only reason I stuck with it was out of respect for Joe. Towards the end of the tape, however was a segment where this guy was a guest on the Joe Franklin show. Suddenly, the guy was hilarious. Joe knew exactly how to squeeze some legitimately funny moments out of this guy. The panel had two other guests, who Joe interviewed as one would expect. But occasionally, Joe would ask this guy, “What do you think Dr. Ruth?” or, “I think Ronald Reagan has something to say,” and the guy hit the mark every time. It was really funny and a testament to Joe’s entertainment sense. I had the honor of being a guest on the Joe Franklin Radio Show in 2004. After 40 years, the show was holding its final broadcast. My claim to fame is that I was the last new person he introduced before signing off. “What would you say is the key to a good interview?” I asked him, on the air. Joe considered for a moment and then passed the question to the Amazing Kreskin, sitting two seats down from me. Indeed, the ability to listen, not only to your panelists, but to any questions from the audience is a far greater asset for running an engaging panel than any level of industry knowledge or dramatic stage presence. I only interacted with Joe five times, but I learned that he was a master of instantly recognizing the best in people and bringing it out. Truly an inspiration. 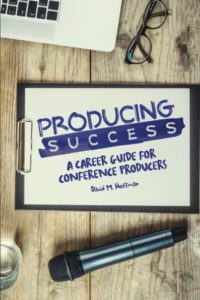 For more lessons about improving your game as a conference producer read my book Producing Success: The Only Career Guide for Conference Producers.